Which games will your team lose because of the NBA schedule? NBA GAMBLERS HUNTING for angles have long eyed fatigue as an edge to be exploited. A brutal back-to-back set that finishes in Denver? A five-in-seven stretch capped by consecutive games and eastward flights across time zones? NBA squads on the wrong end of such games know they'll likely be taking an L well before tipoff. The term those teams have adopted? Fatigue swings outcomes. Bettors know it. Players know it. Oddsmakers who set opening betting lines know it -- and, since the early aughts, acknowledge that they've factored it into those betting lines to keep keen-eyed gamblers from taking them to the cleaners. Then, in recent months, two landmark events unfolded. First, a Supreme Court ruling allowed states to legalize sports gambling. Second, the NBA became the first major U.S. sports league to partner with a U.S. sportsbook, MGM Resorts. That means we can finally discuss -- yell from the rafters, even -- the gambling tool that is Schedule Alert. Back for its third season, the formula remains the product of Dr. Cheri Mah, a sleep consultant to NBA teams and physician scientist at the UC San Francisco Human Performance Center. Mah's formula factors travel, game frequency, recovery time and game location, among other variables, and compares results against more than 12,000 games over the past 10 seasons (2008-2018). The purpose of Schedule Alert? Identify games in which travel and fatigue will weigh disproportionately on one of the two teams. Over the past two seasons, the project has highlighted 96 games and -- based solely on fatigue-related factors tied to the schedule -- correctly predicted the outcome in 74 percent of them. Last season, based purely on schedule- and fatigue-related factors, we correctly predicted 42 of 54 Schedule Alert games. Such success has drawn the attention of more than a few in the gambling world. But so long as sports gambling was illegal in every state but Nevada, we had to keep the potential gaming value of the Schedule Alert on the (wink-wink, nudge-nudge) down low. This season, we've targeted 42 Schedule Alert games: those with a MahScore of 8 or higher (with the formula predicting a loss rate of 63.1 percent). Of those, seven games qualify as "red alert" games, with a MahScore of 9 or higher (with a predicted loss rate of 68.6 percent). Although our formula didn't consider the spread in the past, we retroactively calculated how our Schedule Alert games fared against the spread the past two seasons. Then, with the help of ESPN Stats & Information, we dug into the question: Are gamblers and oddsmakers weighing fatigue as much as they should be? In the 96 Schedule Alert games the past two seasons, Schedule Alert's forecast beat the spread 54.2 percent of the time overall and 57.7 percent in "red alert" games. By way of example: The Westgate closing line pegged the Wizards as four-point favorites in a mid-March tilt against the Heat in Miami. But Schedule Alert saw it another way. The Wizards were playing their third game in five days, the second of a back-to-back set, and they lost an hour as they traveled from New Orleans the night before. The Wizards lost by 27. In those 96 games, road teams were also consistently the far more vulnerable team, often reeling from a hectic pace of games and travel while being pitted against home teams that entered the contests with a rest advantage. As expected, many of these exhausted road teams got smoked, but the closing betting lines didn't reflect that expectation. In fact, in those 96 Schedule Alert games, visiting teams scored 2.7 fewer points, on average, than the Westgate closing lines, per ESPN Stats & Info. 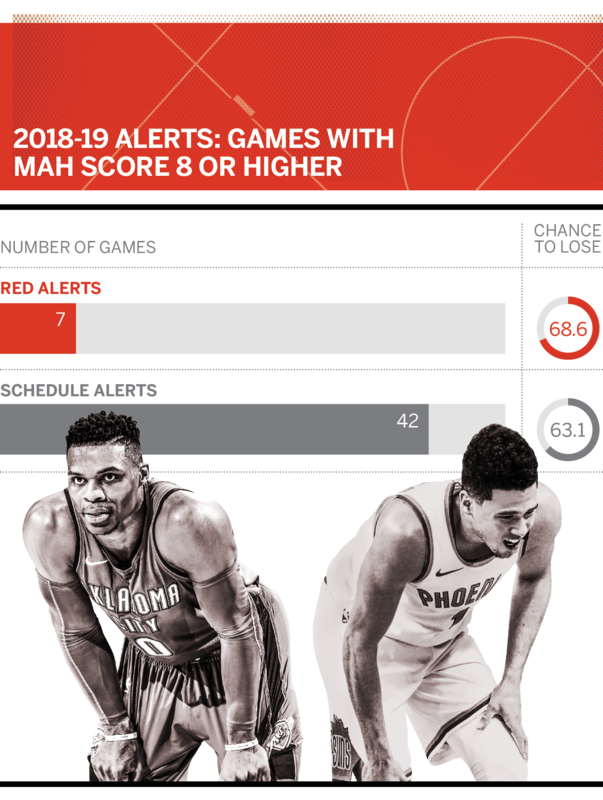 Which is to say, in those Schedule Alert games, both oddsmakers and gamblers consistently believe that a visiting team facing heavy fatigue-related obstacles will play better than it ends up doing. 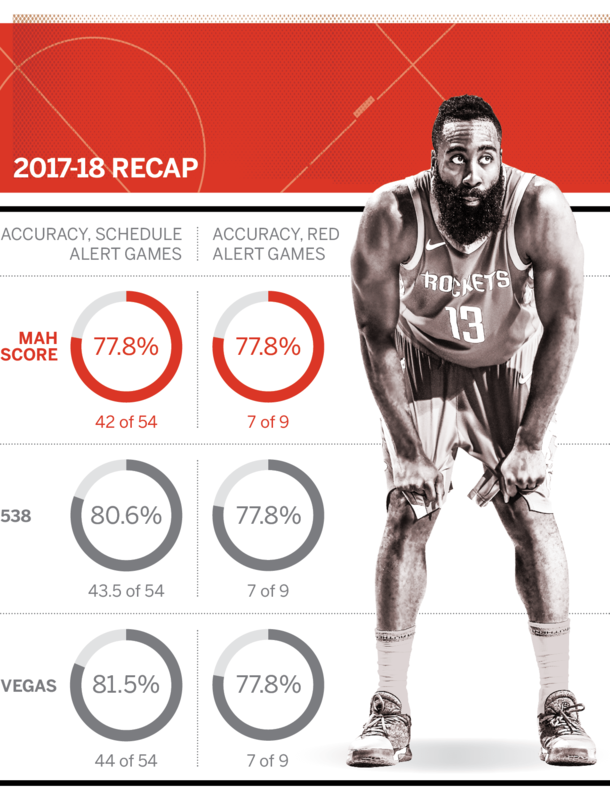 In the words of Jeff Ma, a predictive analytics expert for ESPN who has conducted sports analytics with applications to gambling for the past 15 years: "Essentially, in a small sample size, the away teams underperform in Schedule Alert games relative to what the betting markets predict they will do. So even if the betting markets are taking fatigue-related factors into account for Schedule Alert games, they do not appear to be doing it enough." Add it all up, and fatigue is still a considerable edge -- for NBA teams and for those looking to make a buck off them. Note: We'll release our Schedule Alert games for the second half in January. The Blazers have the dubious honor of kicking off the 2018-19 Schedule Alert campaign. This game will mark their fourth game in six days, their third game in four days (all on the road) and the second of a back-to-back set with overnight travel across time zones. Sheesh. After facing the Pacers in Indianapolis, the Trail Blazers will head out that night for Houston -- gaining an hour along the way -- to face the Rockets the next night. Meanwhile, the Rockets will enter this game with a three-day rest advantage. Don't be surprised if the Greek Freak looks like a shell of himself for this affair in the Mile High City. This will mark the Bucks' fifth game in eight days, their third game in four days and the second of a back-to-back set. But it's no normal back-to-back -- no, this is one of the most notorious travel situations in the NBA: A team travels from a West Coast location (in this case, Los Angeles after playing the Clippers) to Denver (thus losing an hour) to finish a back-to-back against the Nuggets. Ouch. It doesn't help that this is also the final game of a four-game road trip for the Bucks ... nor does it help that the Nuggets will enter this game with a one-day rest advantage. Red alert, Rockets! This will mark their fifth game in eight days, their third game in four days and the second of a back-to-back set that requires eastward overnight travel across time zones, which is never fun. After playing host to the Wizards in Houston, the Rockets will head out that night for Miami -- losing an hour along the way -- to face the Heat the next night in a nationally televised game, no less. The Heat will enter this game with a three-day rest advantage. If Dallas rookie sensation Luka Doncic looks slow, give him a pass. This will mark his Mavericks' fourth game in six days, their third game in four days and the second of a back-to-back set. It'll also be the final game of a four-game road trip that starts in Oklahoma City and moves to Charlotte and then Boston before finishing in Philly. The 76ers, meanwhile, will enter this game with a two-day rest advantage.